Yes you heard it right, finally someone out there is putting money into the sciences that really matter! 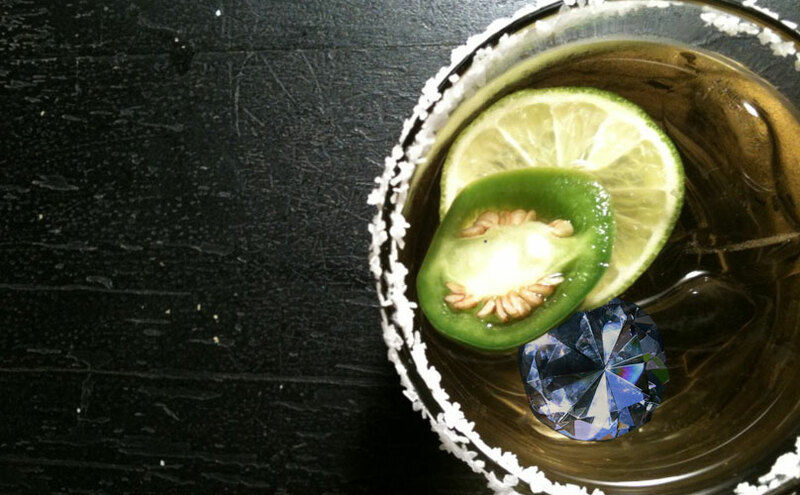 In this article I am going to teach you where this idea started from and exactly what goes into the process of turning tequila into everyone's favorite shinny rock. A team of scientist based out of mexico started looking into ways to create diamonds from organic solutions such as ethanol, methanol, and acetone. The team realized that diluting ethanol in water resulted in very high quality diamond films. This lead them to realize that the ideal compound of 40 percent ethanol and 60 percent water was very similar to that of the proportion ratio in tequila!! 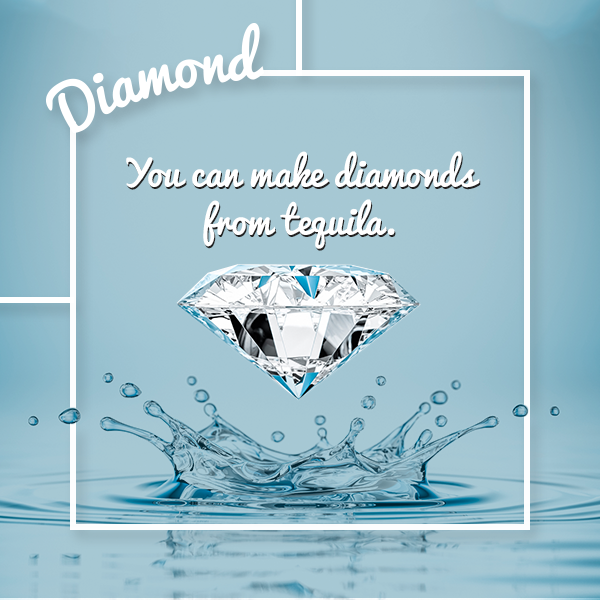 Even more interesting, it turns out that tequila's ratio of oxygen, hydrogen, and carbon lies perfectly within the "diamond growth region." Researchers Javier Morales, Luis Miguel Apatiga, and Victor Manuel Castano from the National Autonomous University of Mexico state that " the resulting diamonds films could have inexpensive commercial applications as electrical insulators." (Psys.org) Diamond films are important because they are used commercially for such things as a circuit boards and certain tools (diamond drill bits) and are often harder to find in nature as aposed to the diamonds used in jewlery. Buy some sweet Mexican kool-aid. Go to the lab and begin "the pulsed liquid injection chemical vapor deposition technique," by using a specially made device that can heat your tequila to 280 degrees Celsius (536 degrees Fahrenheit) turning it into a gaseous state. Put it in a reaction chamber and heat the newly made gas up to 800 degrees celcius (1470 Fahrenheit) breaking down its original molecular structure. Have the resulting solid diamond crystals (100-400 nm) fall onto silicone or stainless steel tray. Do this over and over until you have the perfect amount for your necklace. Results and discussion Tequila was injected at a rate of 6.26 x 10-3 ml) per pulse from high to low pressure (4.5 psi to a few torrs) in an argon flow at 280 °C, prior to flash evaporation. Tequila basically consists of water and ethanol, both molecules will be dissociated through the reactor zone. Because of the bonding energies of C-C, C-H, C-O and H-OH, the ethanol molecule will be dissociated to supply the carbon atoms with hybrid bond (sp3 ) , whereas water provides an excess of hydrogen to form other allotropes. The reactor temperature activates the silicon 3s and 3p orbitals to form the primitive partial covalent bond with the carbon hybrid orbital sp3 . As the temperature increases, the surface reactions rates and the mobility of the adsorbed species are enhanced, thus increasing the growth rate . Additionally, the surface roughness of the silicon substrate favors the nucleation process . This work presents a new and original precursor (Tequila) to growth micro crystalline diamond thin films by the PLICVD technique. Nucleation and growth are strongly related to the nature of the Si and stainless steel substrates surface. Tequila has the adequate C-O-H atomic ration to grow Diamond Like Carbon thin films using the PLICVD technique. This technique is an excellent alternative to produce industrial-scale diamond thin films for practical applications using low cost precursors. taken from the findings of the scientists involved located here. There you have it, you now know the process on how to turn your favorite weekend drink into your favorite shiny rock, however I say we should leave all that up to the professionals. Thanks for tuning in to this weeks blog, hope you learned something you can share at your next get together with your freinds. Glasses raised!